Save a Child’s Heart has conducted another joint surgical and catheterization medical mission in Romania, at the Grigore Alexandrescu Hospital from April 21-28, 2018. This mission was only made possible thanks to support from our team at Wolfson Medical Center and cooperation with Rotary and many other partner organizations. During this mission, a total of 17 lives were saved: 9 children had lifesaving open-heart surgery and 8 children underwent lifesaving catheterization procedures. The full team was comprised of Romanian medical personnel from our partner hospital, Grigore Alexandrescu Hospital; our Israeli medical team from the Wolfson Medical Center; and wouldn’t have been complete without support from partner organizations such as Gift of Life International, Rotary Romania Si Moldova, Rotary USA, Rotary District 5240, Rotary Israel, International Children’s Heart Foundation & Albany Medical Center. In addition to being a surgical and catheterization mission, this was also a training mission. Romanian team members from Bucharest, who trained in Israel with the Romanian team from Cluj, had the chance to work together with both Israeli and Palestinian doctors! In fact, Dr. Manuel Chira from Cluj, along with his resident Dr. Renate Schwartzkopf, led 4 of the 9 surgeries. After the first long day of setting up all of the medical equipment and preparing to start the mission, H.E. Ambassador of Israel to Romania Tamar Samash generously hosted a reception in honor of the medical mission. Attending the event were the medical teams from Wolfson Medical Center and Grigore Alexandrescu Hospital, as well as several local politicians and Romanian Rotarians, such as: Minister of Health Sorin Pintea, Secretary of State Raed Arafat, District Governor of Rotary Romania and Moldova Milian Sopoian, as well as Rotarians from Romania, the U.S. and Israel. Both the former and current director of our Romanian partner hospital joined the event as well. On the second day, our team was overjoyed to see a teenager’s familiar face… It was a child that they’d saved in Israel when he was just months old! Stefan Ignat has lived a healthy 15 years since his heart surgery at Wolfson Medical Center, and was back at our clinic for a follow-up visit. Stefan underwent a diagnostic catheterization so that his heart could be carefully examined, and the findings re-confirmed that Dr. Lior Sasson - during Stefan's surgery all those years ago - had done a wonderful job! His heart looks fantastic. His mother, also a friendly face, was crying with relief and joy at his bedside as he awoke. On the third day, after already successfully saving many children, a 14-day-old newborn named Stefan Minoiu was rushed into the children’ hospital by paramedics. His condition was critical, and they had to act quickly. His health was monitored and the very next day Stefan underwent lifesaving open-heart surgery. His recover during the following days was smooth and speedy, just as his family and our medical team had hoped. Surprisingly, he wasn't the youngest of our patients. Our very last patient didn't even have a name yet because... he was born only three days earlier! 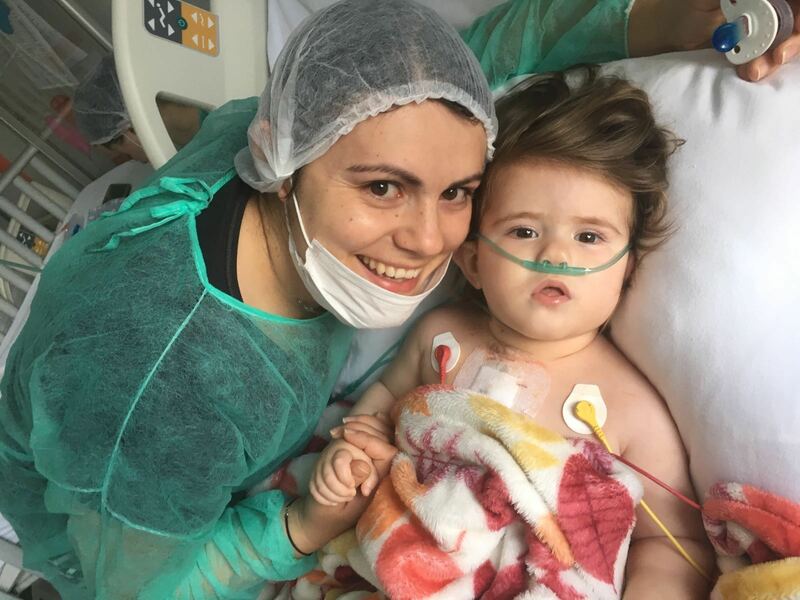 This baby boy needed an immediate and complicated Rashkind procedure so that he could survive until a later, major surgery in Cluj. Dr. Manuel Chira, with the support of the Israeli team, performed a successful Rashkind catheterization, and the child lived!